Snap, Crackle and Pop just got fruity. Or more fruity if you believe those terrible rumors about the night they spent with Frankenberry. Personally, I think people judge Scientologists too quickly these days. 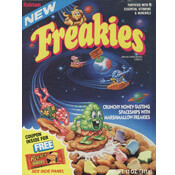 I dug this cereal. Admittedly, I didn't care for the first bite. I was expecting the usual candy fruit flavor but this was a little different. Once I got a few bites down, the new cereal had won me over. I couldn't help but compare it to Fruity Pebbles. By comparison, the fruit taste here is a tad more authentic. A lot of cereals these days are making shady claims that they're healthier than they really are. This cereal makes no such claim. It's a sweet and flavorful breakfast treat. I emphasize the word "treat". No matter our age, we should only be treating ourselves to sugary breakfast cereals once or twice a week (Not just for heath reason, but also because of the wide range of breakfast options you screw yourself out of by sticking to one thing everyday). In the end, Berry Krispies offers all the beauty of original Rice Krispies (sound, texture and taste) with the added twist of fruity flavor and fun colors. It also turns the leftover milk in the into a berry treat. All in all, if you're in the mood to have a fruity kid-friendly cereal, give this one a try. 1 cup serving: 0 g fat, 0 mg cholesterol, 27 g carbohydrates, 0 g fiber. Rice is the first ingredient listed. Sugar is the second. What do you think of Berry Krispies? MAN! They were HELLA good. I was pregnant at the time and could eat boxes of them! Amazing as cereal and they make the best Rice Krispy treats ever! I wish they would make it again. You should just cut up your own strawberries and berries and put them in rice krispies. I think it's been discontinued. Found a bunch of them at Dollar Tree and Big Lots. Meijers also had them on clearance, which is NOT a good sign. HELP!!!! 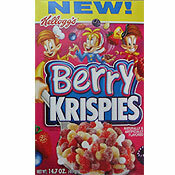 I live in Roanoke, VA. and can't find berry krispies in any grocery store in town! have they quit making them? they are great don't taste like a bowl of wax and not too sweet. I thought i'd finally found a great cereal. This is the best cereal ever - my kids love it!!!! I live in the UK and I'd just like to say that I think your breakfasts look like sooooooo much more fun than ours! Not fair! This cereal is so good! I love it! I love it. It is really good. I love the taste of the berries in it.